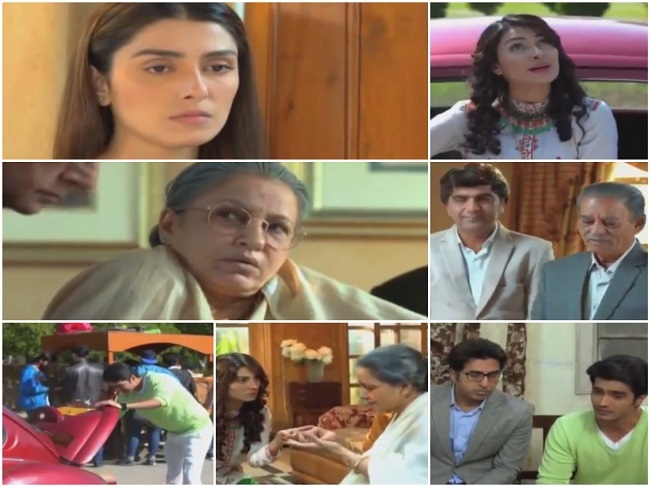 The screenplay, the dialogues, the performances and the makeovers had to be the best part of tonight’s episode. I am quite impressed by the fact that team Mohabbat Tum Se Nafrat Hai has been completely successful in transporting the viewers to their world. The overall feel of this episode was completely different from that of the previous episode but it was equally novel and I felt an instant connection with all the characters. Although this episode was not as perfect as the last one but it was engaging nevertheless and definitely gave me a reason to look forward to more. The first scene was absolutely brilliant, the way ama begum looked at Maheen and the OST playing in the background while Maheen cried, made this scene more powerful. It was a very clever move by the writer and director to keep the suspense alive by introducing Waqar Ahmed’s character in the end because most of the viewers are more interested in finding out more about his character than any other. In tonight’s episode the viewers saw how all these people who hated Waqar Ahmed now, once looked forward to his arrival excitedly. Maheen, who now is completely lifeless was once full of life, carefree and adventurous. Gulrez’s (Shehzad sheikh) character got a lot of screen time in this episode and I must say that I thoroughly enjoyed the way this character was translated on screen. I couldn’t have imagined that a drama which started off on such a serious note would make me laugh not once but many times in the second episode. Gulrez is Wali’s brother and his love for his foxy was the highlight of this episode. Maheen, who is his cousin, “stole” his car to make him miserable and to extract money from him as ransom. The scenes covering everyone’s reaction when they found out that Gulrez’s foxy had been stolen were priceless. Everyone sympathized with the thief more than Gulrez and Neelam thanked god that it had been stolen! Although I thoroughly enjoyed everyone’s reaction and Gulrez’s fascination with his car but Ami begum completely stole the show not only because of those witty dialogues – “bechara Gulrez, bechara chor” “chal angrezi mei bol” – but also because of Saba Faisal’s exceptional performance. Everything from her make-up to her body language and dialogue delivery is flawless. No other actress could have been performed this role better than her. Her character is very appealing but her acting makes it even more so. One aspect of Mohabbat Tum Se Nafrat Hai which I completely love so far is the way all these family members are connected to each other. You don’t have to make an effort to understand how close all these people are to each other. It is also great watching Ayeza Khan experimenting with her looks and choosing projects which are different from one another. Gulrez is the kind of person who wins you over with his innocence instantly but you also understand why a girl like Maheen would not want to spend the rest her life with him. It has been a long time since I watched Shehzad sheikh perform, he did complete justice to his role in tonight’s episode. This episode ended with Wali dropping the bomb on Maheen and Waqar Ahmed entering the house. So far none of the actors in this drama have been typecast, which is another aspect which makes Mohabbat Tum Se Nafrat Hai a must-watch. We don’t know much about Waqar’s character just yet therefore I am hoping that Imran Abbas’ character will also have a surprise in store. The background score was used effectively in this episode in all the scenes. This episode also ended too soon just like the previous one mainly because of the fact that the viewers have so many questions in their mind and it will take a long time for all of them to be answered. Watching this episode was a lot like reading a novel too, the only difference here is that when you are reading a novel you can read all you want to satisfy your curiosity and to find out what is going to happen next but in this case the viewers will have to be very patient. How many of you watched this episode? I would love to know which dialogue and scene you liked the most from this episode. Do share your thoughts in the comments section below.